A/B Testing - What is it and how it helps Web Page Conversion? First of all, what is Web Page Conversion? Web page conversion is essentially turning website visitors into paying on-line customers. A/B Testing is an essential mechanism or tool for helping to improve web page conversion performance where data & content on the website are the main components for conversion. A/B Testing is a tool used to identify changes to web pages that increase the outcome of visitor's interest and subsequently, the conversion rate of the web page. In other words, A/B Testing is a method to confirm a new change on the page design will improve the conversion rate before making that same change to the website's code. Direct mass mailings are classic A/B testing methods used in the past and in some cases still are used by businesses with hard-to-measure effectiveness; therefore, the mass mailings are becoming obsolete in today's market. Current and more frequently used A/B testing to test conversion & variation are online ads, e-mail campaigns, landing pages, or the entire website. 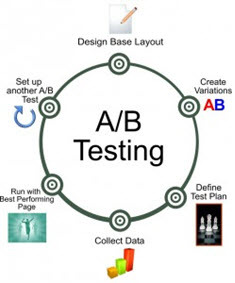 A/B testing is a helpful & fundamental tool to measure and improve web page conversion, and it has become a very important element for web site testing of the conversion rate. A/B testing for your website optimization is a guaranteed way of measuring the effect that web page changes have on every aspect of web user activity such as downloads and purchases made or attempted; therefore, the guessing of whether a change will work or not is eliminated because the outcome is measured. Constant testing and optimizing the web page data content will increase purchases, revenue, downloads and user loyalty. 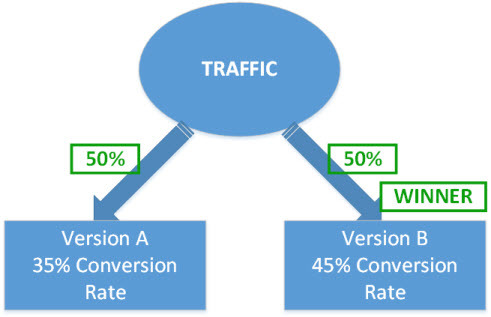 For an A/B test to be performed, two versions of a web page - A is the control and B is the variation - are measured with on-line traffic live and the effect on your site's conversion rate overall is statistically measured. Identify a goal(s) for your businesses website and then you can determine the web pages that will best be optimized to succeed in achieving that goal. The best and most popular improvements are easily shown so you can make an easier choice based on the data. Your business/company will save time because you won't have to spend much time in meetings or conversations going over the data and changes because of the A/B testing results that show conclusively the best option. Your business/company can be assured of the web site/page decisions for optimization with complete confidence! The general principles of the web development field are moving toward evidence-based practice as is provided using A/B testing strategies as an important part of your website's search engine optimization methods; your business/company will obtain the full benefits of SEO! With on-line purchases growing year-by-year, let us help you improve your web page conversion rate so you will gain more revenue from on-line customers!